The ground floor area is 100 square meters indoors. Crazy Cart Indoor Drifting and Racing, it’s perfectly nimble and very versatile indoors as well. Power slides through corners. Variable speed with right foot accelerator pedal to control. Drivers also can throw fish tails . 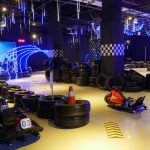 Experience the thrill of racing on our indoor race track in one of our purpose built Crazy Carts.